Delve into the best riding experience of your life with the futuristic new Acton Blink QU4TRO! The planet’s first and only board to run on four-wheel drive with 4 motor hubs, the QU4TRO comes at a reasonable price and provides state of the art performance. Inspired by all things sci-fi, this jet black and neon green beast is sure to leave you wanting for more. It certainly caught our attention. It is equipped to handle an alarming incline rate of 30%, and it aptly called the conqueror of all hills! The Qu4tro comes with a Bluetooth enabled remote, which is light to carry and fits all hand sizes. It’s sure to turn heads, and has been titled as the most anticipated board of 2017! Is Acton Blink QU4TRO Safe? Is the Acton Blink Qu4tro Worth the Cost? When it comes to looks, the Blink QU4TRO beats all. It reminds one of the Tron light cycles, made from strong robust carbon fiber as the base, along with military aircraft grade restructured Aluminum encasing. Incorporating both safety and style, this electric board has four signature LED lights for treading at dark, is water resistant and super sleek, with smooth movement. The Original Acton green wheels are encased in matte black carbon fiber. You can’t hear the motors, unless you are on a quiet pavement. The QU4TRO has platinum class grip tape, with a green line that glows in the dark. The whole aura of the deck is almost like that of the Movie-The Matrix. It’s 17 lbs. in weight, owing to state of the art packaging of high quality motors into a simplistic minimal board design. The board is long enough for 6 footers to ride on it, being 34 x 9 inches! The QU4TRO achieves high speed in a matter of seconds, going up to 23 miles per hour! Its range is pretty damn neat, 22 miles for every full charge. 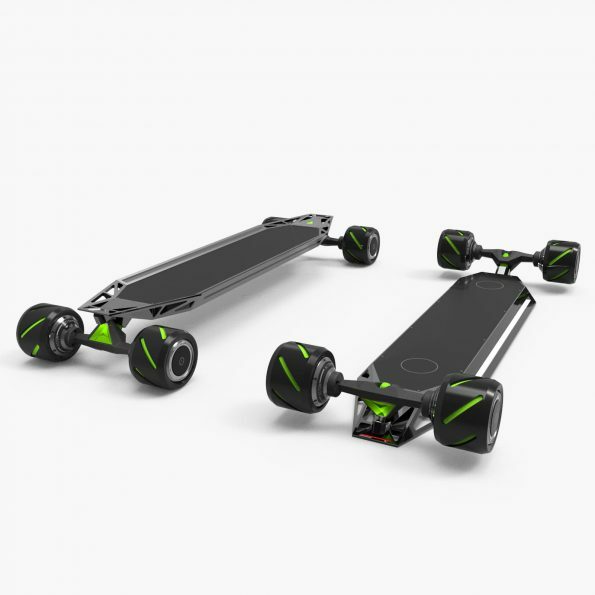 Although charging takes 3 hours, it is nothing in front of the hours you can spend on the board, riding to places. It comes with 30% grade hill climbing, its niche technology enabling it to ‘aim for the hills’, so to speak. It has 1600W, lithium ion batteries, with Panasonic cells– quality which will never wear out or disappoint. One of the prime reasons for Acton’s continuously increasing performance in boards are the powerful batteries that the board stores in a minimal steel encasing (stainless). It comes with a regenerative braking response system, and the grip is excellent! 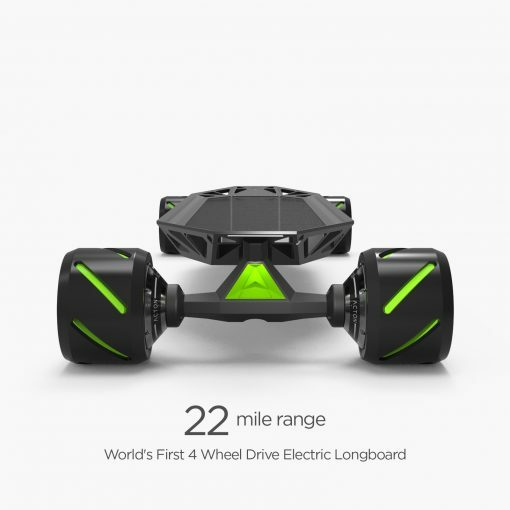 The four signature Green LED lights around the board, don’t drain much of the battery, and would still give you the same range, if not, half a mile less. The coolest addition to the board is the Bluetooth enabled wireless remote, which serves a dual purpose! This remote can be used as a handle to carry the board, when you’re walking with it- a locking mechanism ensures the safety of carrying the board with this handle. The other thing that makes the Acton Blink Qu4tro unique is its 4-wheel drive mechanism, with 4 built in motor hubs! The board was clearly designed with safety as the first and foremost priority. 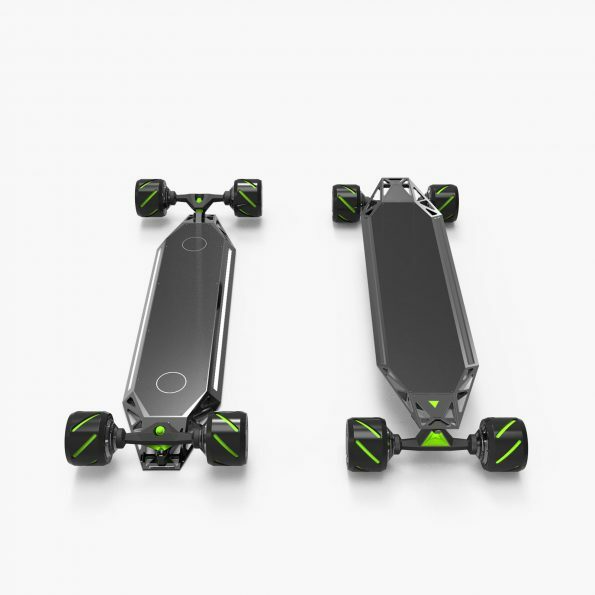 Despite having a top speed of 23 MPH, the board has super fluidic Regenerative Braking Mechanism, which prevents the rider from falling off the board, on a panic brake. The super traction grip tape which runs across the board is specifically designed to be resistant to wear and tear from the soles of shoes, and feet- and water! It has 3 ride modes, giving the rider a choice of Beginner, Intermediate and Pro, where foremost is the best mode to learn electronic skateboarding with safe low speed. The 99 mm Acton Wheels prevent slippage and are resistant to rocks and pebbles, which run on any terrain. It also comes with a sensor enabled low battery warning system. The board is light, long and has excellent grip with buttery smooth wheels for noise free, smooth cruising. Being the first of its kind, with 4-wheel traction, and still managing to be in the price range of several others having fewer features, certainly makes this board worth the money! It owes its light weight to the carbon fiber, which is well known for its properties of robustness and rigidity. It comes with a 6-month warranty, and a month’s worth of absolute guarantee. Service centers are available all around, although they do not have frequent customers, for the Qu4tro needs almost no maintenance at all. The board and its accessories come up to $1699, which is the best bet in its range. 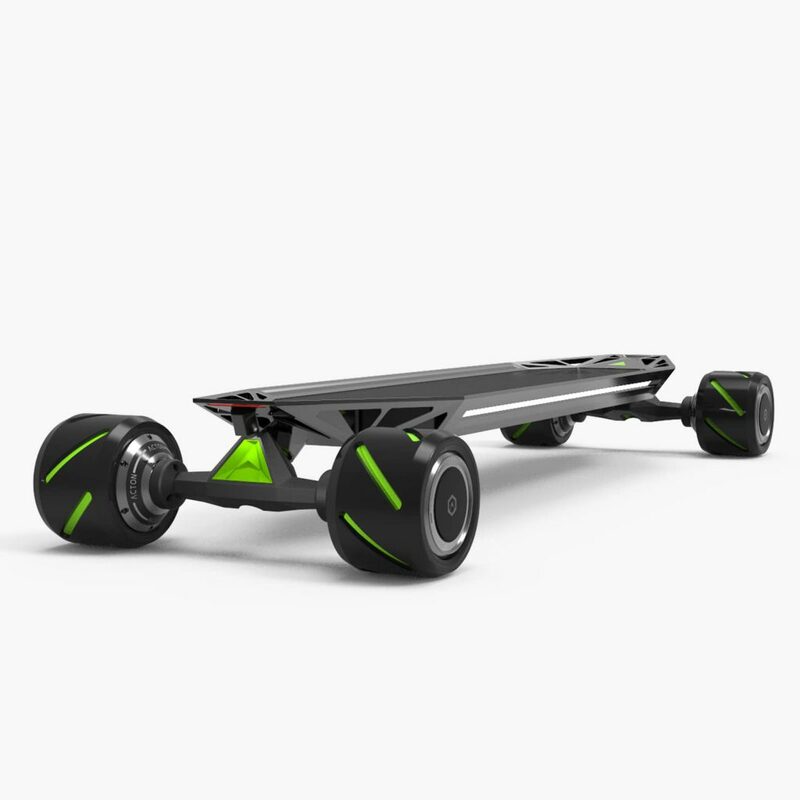 This e-longboard is assured to give you a safe, fast, comfortable ride, even on rough and rocky paths.